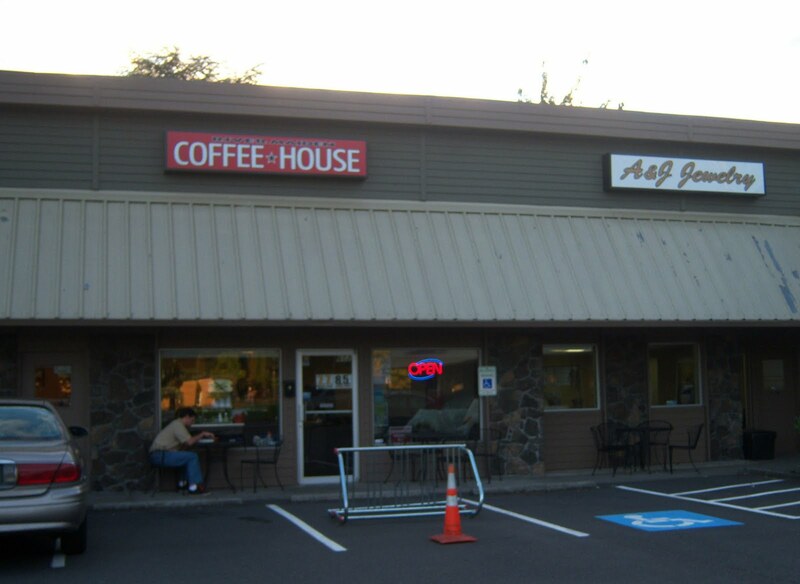 If the city of Portland doesn't have enough coffee for you, cross the river into Vancouver, Washington. Making up a good chunk of the Portland metropolitan area, Vancouver not only boasts being the original Vancouver (the BC one was incorporated 29 years after Washington) but it also holds its share of good coffee. My only visit due to my short time in town was River Maiden Artisan Coffee. A coffee entity located both in the downtown and in a small strip mall (off Devine Rd), they boast Stumptown coffee and a Clover. I chose the Devine Rd locale for proximity and upon arrival, found the cafe in a lackluster tan building with the boring character flowing inside to a cafe with little pizazz in its drop ceiling, fluorescent lighting and run-of-the-mill furniture (I know atmosphere isn't everything...but it is something). As for my order, I ordered an espresso of Hairbender and Stumptown's Colombian La Esparanza. The clovered Colombia was smooth, with flavors of chai, cinnamon, molasses, pound cake, sesame and a little butter with a fleck of cayenne (a great cup of coffee). The espresso held notes of spicy lemon, cocoa, bit of pepper, cloves and a subtle brightness, all amidst a well-pulled shot (i.e. a decent espresso). The tea I did not note. To say the least, River Maiden held good coffee but not so much an alluring ambiance. Thus, especially if you frequent Vantucky, roll on in to River Maiden. Last post on my blog is in English, I hope you would like to stop by and leave a comment. Thanks for the great feedback. Just like some of the best foods can be found in local 'dives', good coffee can be found in a coffee house dive! We would like to thank you for maintaining such a reputable blog. We know that it takes time, effort and commitment to keep such a blog and as such, we have added your blog as one of the top Coffee Blogs. Thanks for the honor. Do you have smaller badges (1/2 the size of the wide one (125x53) would be good).